Nowadays it is more and more evident the existence of a connection between your body’s posture and your teeth or, to be more accurate, in only one term the skull-mandibular-spinal ratio. If such connection would be true, how would it be possible to solve the posture and facial symmetry issues? In order to fix an asymmetrical face or an incorrect posture, particularly a kyphosis with protruding skull and winged scapulae, and a strong lumbar lordosis, would then be proper to take action on the mouth? Let’s find that out in the article, so that you will be able to understand how ultimately solve your postural issues, both from health and aesthetic points of view. I have no intention to drag it forever providing the answer so looked after at the end of this article just like everyone does, instead I will answer immediately. Well the answer is YES! Such connection does exist; What didn’t exist up till now instead, was a tool and a method that would allow you to solve issues like backache, wrong posture and facial asymmetry. These three issues are tightly connected! They all have a common cause, that is they all depend from an incorrect skull cervical mandibular ratio or skull-cervical-spinal dysfunction. In concrete terms they depend from the wrong position of the skull on the mandible. Let’s analyse one by one these three common issues that affect, more or less, 98% of the world population. The cause of your facial asymmetry depends from the relation of the skull with the mandible. 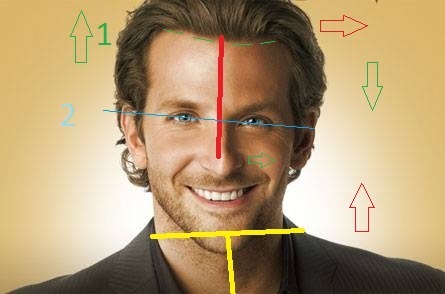 As you can see in the picture Bradley Cooper has his skull latero diverted towards the left, that is it is tilted more towards the left with regards to the mandible. Pay great attention to this point. 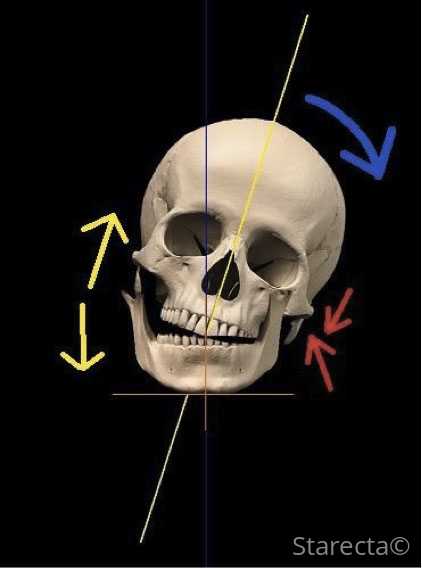 The latero deviation of the skull towards the left does immediately create an asymmetry in the length of the masseter and temporal masticatory muscles, in fact the left masseter and temporal muscles are in such situation shortened. The right masseter and temporal muscles are instead lengthened. The more a muscle is lengthened the more weaker it will be. Pay great attention now to this other point: When the masseter and temporal muscles become shorter, they also become stronger, consequently they will drag towards them the soft parts of the face and the cartilaginous parts, or even the scalp, or the eye line, or even move the nasal septum and divert it. In a few words they will steer towards one side, in this case the left, all the soft parts of the face with regards to their ideal symmetrical location. We can identify, thanks to these notions, various asymmetry factors: The scalp line is dragged towards the left and the bottom, the left eye is dragged downwards, conversely the right eye is dragged upwards, the nose is dragged towards the left, the left cheekbone and the mandible left rear part look more developed and marked compared to the right counterpart. When the skull-mandibular imbalance affects, through the occlusion during the swallowing, the underlying structures it will transfer the asymmetry to the rest of the body. This way the left shoulder will rise because its muscles (trapezius muscle, breastbone-mastoid muscle, scalene, hyoid muscles) will shorten. 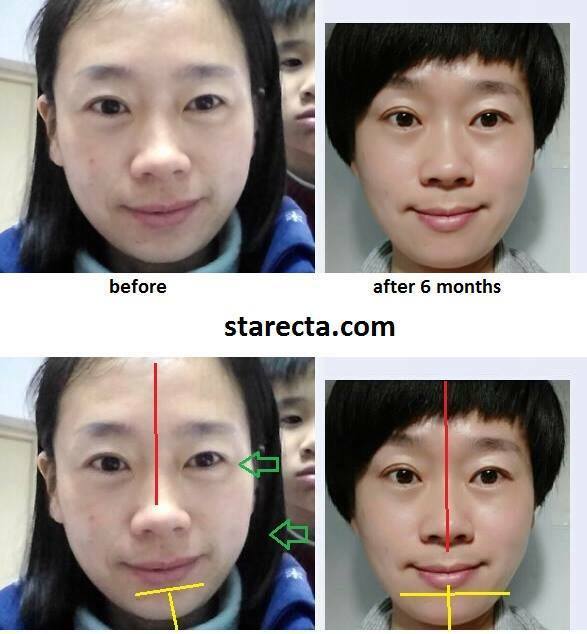 With the Starecta method this individual will achieve a symmetrical skull-mandibular ratio in a totally natural way. The Rectifier will make both the masseter and temporal muscles return in a symmetrical position restoring the correct muscles lengths. Consequently, the soft parts of the human body will go back to their ideal position. Thanks to the Rectifier you can fix this issue just like these two girls did. The Rectifier balances again the correct ratio between skull and mandible so that it will give again symmetry to the face. When the Rectifier distributes symmetrically the occlusal forces during the bite closing the masseter and temporal mandible muscles too are activated in a symmetrical manner. This way the masseter and temporal facial muscles of the stomatognathic system, finally symmetrical, will move the soft parts like: skin, cartilage, eyes, ears, part of the nose, mouth and cheekbones. The Rectifier is nothing but an instrument that will allow you your body to achieve the correct musculoskeletal postural attitude, chic begins from the head and reaches the feet. 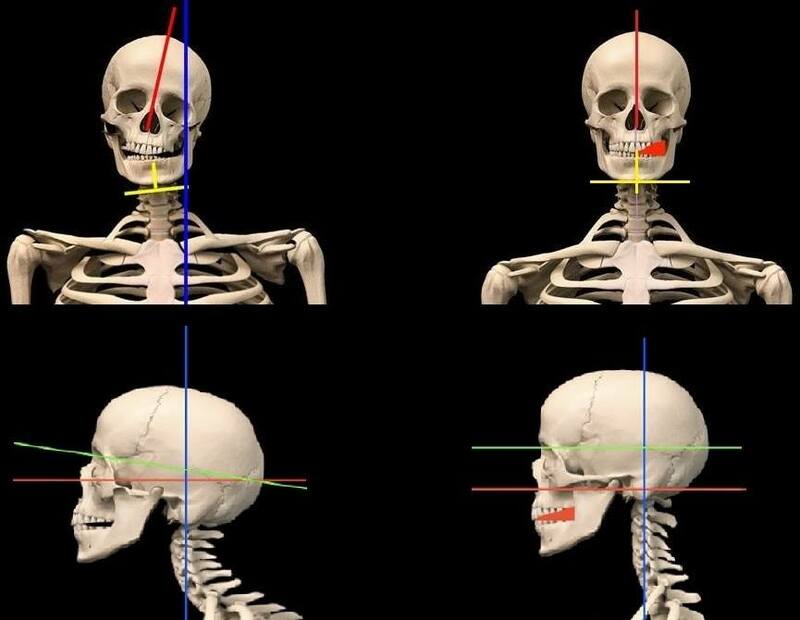 In summary, when an incorrect skull mandible ratio happens, also called cervical- mandibular dysfunction, the first part of the body affected is the skull posture and face symmetry. However, the skull cervical mandibular dysfunction continues its race through the whole of the body creating damages from head to toes therefore creating an incorrect posture. An incorrect posture can be recognized in the body in various ways and there is no need of being an expert in posturology to acknowledge that, it is sufficient to be naked in front of a mirror and watch with attention ourselves. It will so be possible to observe: wrong posture of the head, forward skull, head falling on one shoulder, one shoulder higher than the other one, asymmetrical breast, asymmetrical dorsal muscles, belly leaning on one side, pelvis askew or rotated, different length of the legs, dorsal kyphosis, lumbar lordosis, scoliosis, twisted feet etc. 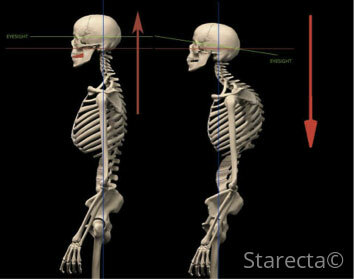 After the face asymmetry what is soon affected by the wrong skull mandibular rate is the body’s posture. The skull positioning on the mandible drives the spine and consequently the posture of the whole body. We shall think of the skull positioning on the mandible as if it were a drawbar steers a ship (the spine). If the drawbar (the mandible) is not aligned, the ship (the spine) will begin bowing and the same is true for the cranial-cervical-mandibular system. So, we don’t have to think of today’s man like a being that has deeply evolved since the times we were jumping from one tree to another. In fact, we did acquire an upright position just in 13 million years, and we don’t have to think of our species like a point of arrival, but of biological beings that are still transforming that are looking in the course of thousands of years for the best manner to counter the law of gravity. Before all the comforts of the modern age would reach us, mankind had to battle for millions of years against the law of gravity. This has allowed our species, in the course of thousands of years, to improve its own genetic heritage. The many obstacles faced in the past had made possible for the strongest and fittest would reproduce to the detriment of the weakest ones. Besides muscle strength, man distinguished himself because of his incredible intelligence (not all of us unfortunately) and so his marked ability to solve problems has allowed our species not to have to come out of a cave with a club in his hand and run quicker than a gazelle, but to be able to get food at a supermarket and work comfortably in front of a pc. Therefore, our posture not being any longer subjected to the efforts man has to undertake, just like he had partly stopped his genetic improvement. Our luck consists anyway in being able to solve incredible problems with our intellect saving many millions of years of evolution. It is sufficient to think that in the whole story of mankind, since he began walking on two feet, the greatest discoveries and awareness happened in the latest 600 years. Only think of Galileo Galilei, Christopher Columbus, the Wright brothers, Guglielmo Marconi, Tesla, Ford, Bill Gates, Musk, Zuckerberg; people that with their brains have sped up human evolution of thousands of years. Couldn’t it be the same thing with our posture? In fact, it is really like that. What has been confined to genetics, now it is up to Biomechanics! Thanks to Starecta we have understood that the core of our postural system is the skull mandible spinal or cranial-cervical-mandibular ratio. What was before the task of genetics is now the task of biomechanics. Thanks to Starecta (How I Finally Straightend my Spine) we have understood how to take action in this postural Bio-mechanism that is accompanying us since when we gained the upright position. The difference lies in the fact that until today we were not aware of that. The incredible thing is that, just like many paradoxes in the history of mankind, this discovery did not happen in the mind of some scientist, posturology expert, gnathologist, dentist or doctor. This was done by a boy that had been dreaming since he was a kid only one thing: having the back straight! It is plain that today the technique without a proper emotional impact won’t produce great effects, and the same emotional impact with no technique cannot go that far. The process with which the bio-mechanism that adjusts our posture was discovered is a combination of emotional impact, fight against death, in depth study, meditation techniques, prayer, research and even aesthetic sensitivity. All this was used to prepare an innovative postural device that is placed in the mouth. A dental bite (the Rectifier) that was built and applied in a unique manner, able to activate the mandibular lever that will re position the skull to its original ideal place with regards to the body. This way the skull connected to the spine will re balance the whole body providing a correct posture. We can see in the picture the immediate and powerful effects of the actuation of the rectifier on the body posture. Thanks to the Rectifier, that is that instrument able to balance the whole body and improve your posture in a whole natural manner, consequently your back will experience an immediate benefit. The Spine is made of many small bone segments that are the vertebrae, which are separated by the intervertebral discs that will provide elasticity and protection to the marrow flowing inside. The spine supports the mandible as well as our skull as shown in this scientific article (insert our article) tank to a system of levers. If out of stress or genetics or for bad dental works, the support to the mandible would fail thanks to the lever that confers the skull in the molar area during its occlusion, all the weight of the skull will be on the spine that shall find exhausting compensations in order not to walk twisted. The weight of the skull due to the force of gravity and to its own masseter and temporal muscles that work badly without a proper molar ratio, will therefore crunch the vertebrae and all the intra vertebral discs. It also happens that the body in order to compensate the weight of the skull will begin to twist on itself, to become asymmetrical, twisted, showing kyphosis, lordosis, causing backache out of the compressions of nerves, bones, tendons and muscles. 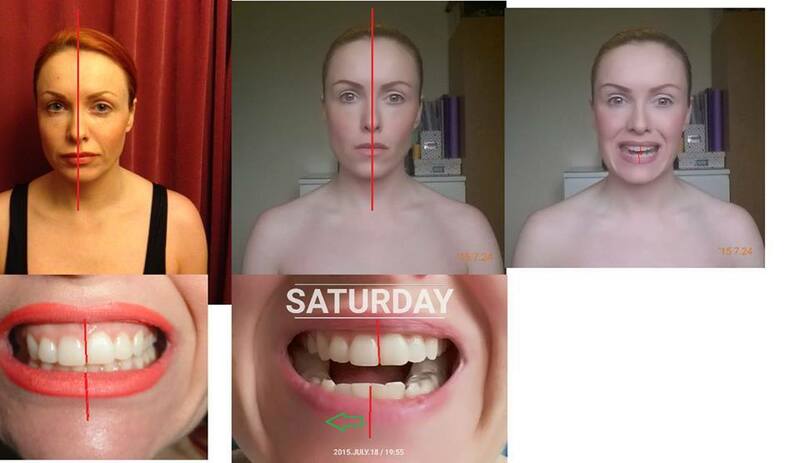 You can see in detail all the stages of the postural decay caused by an incorrect skull mandibular ratio. Now, Thanks to this incredible tool you will be able to solve simultaneously all these issues. I’m close to 1 month of using Starecta…. > Only had 2 seizures this month – used to be daily. > No head pressure – was so bad i used to feel sick and have to go to bed. > No pain in neck or head – not had any pain relief since starting. I was taking every 3-4 hours before. I’ve even booked a holiday and leave next week which I wouldn’t have done before because things were so bad. Here’s to the next 4 years …. seriously cant wait now to see the outcome. Hello!! So today I started starecta after weeks receiving the plug and play (was kinda frightened to try it) so my symptoms are the following one year after whiplash. Tinnitus, dizziness, occipital neuralgia, cervicogenic headaches , brain fog, head pressure, fainting feeling, fatigue, anxiety, c1 subluxation…after I gave birth last february I started to have stiff neck and muscles to the right shoulder, lazy left eye and blurred vision in left eye, muscle spasms at night, difficulty catching my breath and lump in throat feeling… this morning went to brunch and shopping with friends without recrifier. I felt out of space dizzy and the head pressure feeling… got fed up came back home and decided to activate my bite. Since than no head pressure, slight neck stiffness and as I am writing this I am also folding laundry in the evening…something I haven’t done in weeks especially at night since my head pressure puts me k.o. in bed. I hope it will go on!! wish i was there… i found starecta by random chance writing to plato back in fall 2014… probably saved my life 🙂 by the way was i the 2nd american? Today is my first day wearing the starecta rectifier…. My normal is anxiety all day, pain in my neck and back of head, pressure type feeling in my head, extreme fatigue, unbalanced/ feeling dizzy, numbness in right arm and hand, poor vision and black spots in right eye, seizures, pins and needles all over my body, electric shock type zolts through my body, ringing in my right ear, slurred speech. Pain med constantly throughout the day. Walked my daughter to school, by the time i got home i was covered in sweat, severe anxiety, feeling like I couldn’t get through the day, severe pain in my head, and nearly fell twice. 10am I put my rectifier in…..
30 mins after it being in – felt like my right ear opened up, felt odd but good. After an hour I noticed I was walking around without the feeling like I was going to fall. Walked to school – no anxiety, no feeling like I would fall, no dizziness. Did 3 client calls today – usually i feel ill on the call and have to go to bed after. I did all 3 and felt ok.
Can move my head without extreme pain. It’s 9pm and i’m still awake – usually i’m crawling to bed at 6:30pm. My seizures are mainly at night when I am in bed – I’ll post tomorrow to let you all know if I had any seizures. I just started using it – only day 3. I can tell my bite feels different when I’m not wearing it. Also am a lot stronger while wearing it. My metabolism seems to be faster too and stomach is leaner. It’s only day 3 though, but so far I’m very happy with it! Day 30 here. It’s correcting the spine, and everything else follows. Better sleep, more confidence, easier to walk less strain(I had bent knees) it was like everything opened up. Clearer deeper voice, the very portruded adams apple are going back to it’s proper position, the portruded shoulder ‘spikes’ are going into proper position, the humpback is straightening, stomach isn’t so bloated anymore. It doesn’t hurt to stand anymore. I don’t have to alleviate my back pain anymore by lying down. It’s pretty much gone. People are responding to me in a different way…all of a sudden they respect me and are nicer to me(I’ve had a very weak body language prior to starecta) I have a stronger body language now. I walk with presedence and assertiveness now. That was physically impossibke before. The only problem I have is…. I lost my container yesterday!!!! Hahahaha I have nothing to store it in now. I’ve been using it for three days now for about 8 hours per day. I feel very balanced and stable, with increased energy. I noticed my inner organs seemed to “decompress”. Overall I feel very good. Thank you very much for puting so much work into developing something like starecta!!! Okay, after 3 years using the rectifier I am done with Starecta. Changes to my spine were phenomenal, but there is still work to do. However, the rest I need to do working on the spine directly and the results will filter back up to the skull itself. You can see my frontal facial shot and despite having monster height on my rectifier for almost 1 full year out of the 3, I don’t have the long face that you are all so scared of and keep in mind I was even using HGH during that time so these fears are unfounded IMO. My occlusion is edge2edge now which at least 1 occlusal expert said is the ideal from a functional standpoint I had a dentist put buildups on my lower right and left molars/premolars to close the open bite and provide solid contact and support. Took 20 minutes and cost very little. You could even do it yourself with materials purchased on eBay. Problem is finding a dentist who will agree to do this because most of them consider my occlusion an outrage, and that I will destroy my teeth with these buildups, give myself TMJ, and open them to a malpractice lawsuit since most dental experts would consider what I have done insane, and that a dentist who goes along is in violation of his Hippocratic oath. Sadly, most dentists are hopelessly uneducated and arrogant. One of the most obvious things that nearly all dentists including the “alternative” ones totally miss, is that the biggest problem is teeth losing their height – and that the ONLY solution is to artificially restore said height. They try to “close” the bite in all these ridiculous ways when all they need to do is restore the height. It’s so damn obvious but everyone misses it. Thank you Moreno and Valerio for teaching me Starecta back in the day! I will still be here moderating and keeping you posted as I continue to work on my physical structure. When I met Starecta a few years ago, I could not believe it. Moreno Contewas a great friend for me and also today. He told me that the Starecta method works very well. I’m a dental technician, so I decided to work with him and to try it on myself. Today after two years, my back is better, the pain in the neck is just an old bad memory, vertigos go away, my life is better! I suggest you to try this fantastic method … the Rectifier is very easy to use and to activate, it works great, it can change your life! It’s not a joke… #withStarectaYouCan !!! I tried it on for a couple of hours. My neck and back were instantly relaxed. I felt really loose.. might have to take some dancing lesson once I finish all this up. After I took it out, I felt the release continue for a solid 24 hours. A few days later, I put it on for a few more hours, and same story. I woke up the next day feeling like my jaw became “longer.” I have increased range of motion there too. I’ve been doing all kinds of physical therapies, and I do not have any problems right now – or better put – yet – so maybe that is why body is responding so well. In either case, I am really happy with it. I think it’s a great product for a v1, and a great investment for the price. In the future, I plan to use it while working at my desk – I think it helps force my body into a more erect position while sitting. I’m also curious what the story is with this and exercising.